Beamex introduces MC6 Workstation, a new and advanced panel-mounted calibrator and communicator. In today’s process industry, equipment is often calibrated out in the field. However, there are many advantages to performing maintenance and calibration tasks in the workshop, which often make this the preferred solution. For example, a workshop is a controlled environment, enabling better accuracy for calibration work. In addition, all equipment is always available and ready to use. Beamex has been producing versatile, modular workshop calibration benches for more than 20 years. With the introduction of the new MC6 Workstation model, the calibration and communicator capabilities of the Beamex workshop offering are raised to a whole new level. The MC6 Workstation offers calibration capabilities for pressure, temperature and various electrical signals. It also contains a full fieldbus communicator for use with Hart, Foundation Fieldbus and Profibus PA instruments. What really makes the MC6 Workstation unique is its usability. It has a large 5.7” colour touchscreen with a multilingual user interface. The ergonomic design of the panel-mounted MC6 Workstation makes it ideal for sectors such as pharmaceuticals, energy, oil and gas, food and beverage and the service industry, as well as the petrochemical and chemical industries. The MC6 is one device with several different operational modes, which makes it fast and easy to use – and technicians have less to learn. The operational modes include Meter, Calibrator, Documenting Calibrator, Data Logger and Fieldbus Communicator. The MC6 Workstation communicates with automatic pressure controllers and temperature blocks, enabling fully automatic calibration. 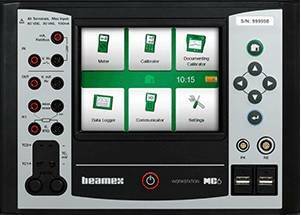 In addition, the MC6 Workstation is part of the Beamex Integrated Calibration Solutions (ICS) offering. The MC6 Workstation is capable of communicating with Beamex CMX calibration management software, enabling fully automated and paperless calibration and documentation.